The Nashville Sounds Baseball Club announced its 2018 home schedule at First Tennessee Park, in conjunction with the Pacific Coast League today. The fourth season at state-of-the-art First Tennessee Park begins on Tuesday, April 10th when the Sounds host the Iowa Cubs - the Triple-A affiliate of the Chicago Cubs. Opening Night against the Cubs is the start of a seven-game homestand that also brings the Omaha Storm Chasers - the Triple-A affiliate of the Kansas City Royals to town. First Tennessee Park plays host to 11 different homestands to make up the 70-game 2018 home schedule. The longest is a nine-game stretch from May 21-29 when the Sounds welcome the Colorado Springs Sky Sox - the Triple-A affiliate of the Milwaukee Brewers, and the Oklahoma City Dodgers - the Triple-A affiliate of the Los Angeles Dodgers. "For the last three years, the City of Nashville has packed First Tennessee Park and has made it the best ballpark in Minor League Baseball," said Sounds General Manager Adam Nuse. "We're excited to continue building on the ballpark's success and welcome even more fans through the gates during the 2018 season." For the first time in First Tennessee Park history, the Sounds will play at home on the fourth of July. The team has not played a home game on July 4th since 2011 at Greer Stadium. Other notable home dates include Monday, May 28th when the Sounds host the Dodgers on Memorial Day. The Sounds close the 2018 regular season with a home game against the Memphis Redbirds - the Triple-A affiliate of the St. Louis Cardinals, on Labor Day (Monday, September 3rd). The Sounds will play on the road on Mother's Day (May 13th) and Father's Day (June 17th). The longest road trip of the season is a 10-game, three-city trip from August 21-30. 34 weekend dates fill the 2018 home schedule including 12 Friday games, 11 Saturday dates, and 11 Sunday contests. The 41st season of Nashville Sounds baseball begins with a five-game road series from April 5-9. The 2018 season will be the first in which all Triple-A Baseball teams play a 140-game schedule after playing 142 games in 2017 and 144 games in previous seasons. 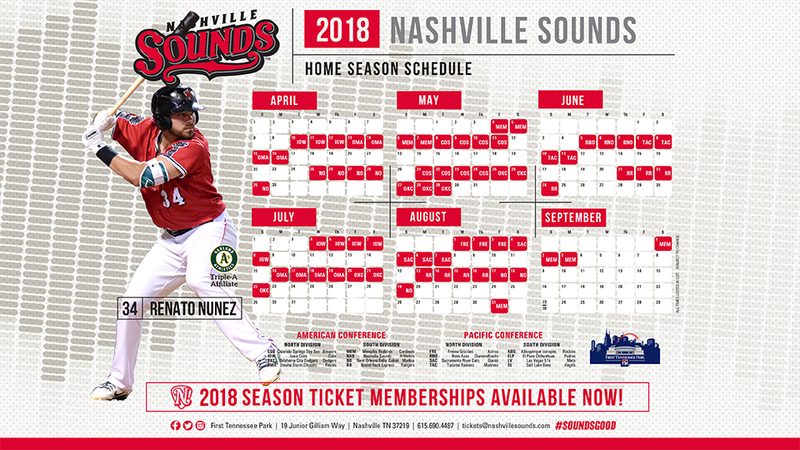 2018 Season ticket memberships are on sale through the Nashville Sounds ticket office with special early-bird benefits and incentives through the month of August. For more information on membership packages, call 615-690-4487, or e-mail tickets@nashvillesounds.com.